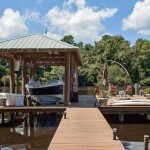 Beautiful Intracoastal setting with dock, pool, detached 3 car garage and spacious 4 bedroom 4 bath custom home. 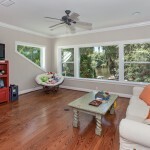 Open in design, this home features a home office, the master suite downstairs with 3 bedrooms upstairs, along with a large bonus room that has incredible water views. Each upstairs bedroom has its own bathroom for privacy. The bonus room is a great flex area and includes a small kitchenette with cabinetry and granite countertop. Entertaining is easy in this home. 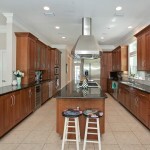 The kitchen features a center island cook and prep station, granite countertops and S/S monogramed appliances. The spacious eat in area off the kitchen is perfect for informal gatherings as is the separate dining room with open passageways to both the kitchen and living room. 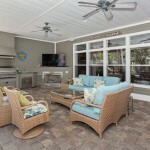 Gorgeous pool with spa offers the Florida lifestyle with Summer Kitchen, gas fireplace, TV, fire pit, covered dock and boatlift. Property is fully fenced and includes an underground dog fence. 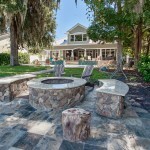 Beautiful trees and landscaping completes the charm and beauty of this low country estate.